Cleaning your jewelry at home on a regular basis is a good idea to keep your gems in good condition. Weekly cleaning also provides you with an opportunity to inspect your jewelry for setting damage or loose prongs, clasp damage, stone fractures, cracks and chips. White gold is a popular choice for jewelry, because it's more durable and valuable than silver but more affordable than platinum. White gold does have its drawbacks, however, as it tends to show dirt and tends to take on a yellow-tinged tarnish with frequent wear. You don't need to buy expensive jewelry cleaners to keep your white gold jewelry looking great. 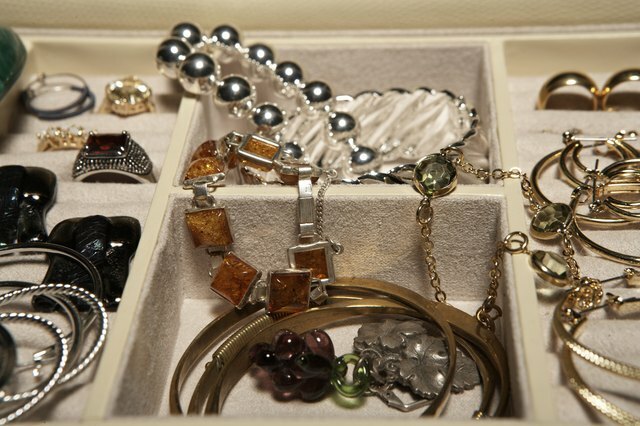 Use household items, such as alcohol, as part of a cleaning regime that will leave your jewelry looking its finest. Place a couple drops of dish soap into a bowl, fill it with hot water and immerse jewelry in the hot soapy water for approximately 10 minutes. Scrub the jewelry with a soft bristle toothbrush to remove dirt particles and debris. After scrubbing each item, place it on a clean paper towel. Rinse the bowl to remove traces of soap before filling the bowl with warm water. Place the jewelry inside the bowl, and swirl the water to rinse the items before placing them on another clean paper towel. Empty the bowl, and pour in a bit of ammonia—enough to immerse the jewelry items. Allow them to sit in the ammonia for 2 minutes to remove the yellow tarnish that can develop on white gold. Rinse the bowl, and fill it with fresh water, immersing the jewelry in the water. Swirl the water in the bowl to rinse the jewelry before placing it on a paper towel. Empty the bowl, and then pour in rubbing alcohol. There should be enough alcohol to fully immerse the jewelry. 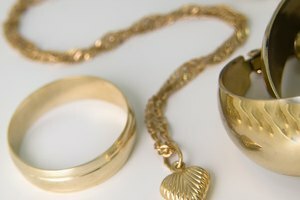 Allow the white gold jewelry to sit in the bowl of alcohol for 5 minutes. During this time, you can scrub each item with a clean toothbrush. This will remove any residual oils or dirt. Remove the jewelry from the bowl of alcohol, and place the items on a clean paper towel. 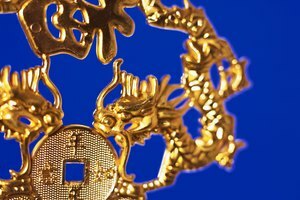 The alcohol will cause the jewelry items to dry very rapidly, largely eliminating the potential for water spots. Polish and buff the jewelry items with a polishing cloth, if desired. Typically, one pass is all that's required, as the alcohol removes oils that can dull luster and shine. Some white gold jewelry is plated with rhodium, which can wear off over time, particularly on rings that are exposed to lots of friction. This can cause the jewelry to take on a distinct yellow hue. 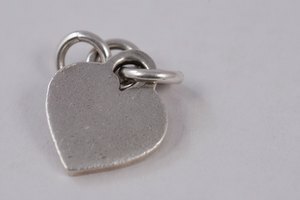 No amount of cleaning will remedy this problem; you will need to have the item re-plated with rhodium. 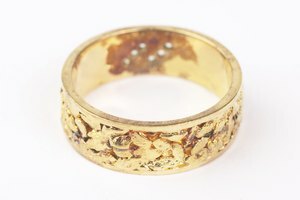 Always inspect jewelry during and after the cleaning process. Look for any signs of damage, especially in the vicinity of the clasp or setting. Never wear a damaged jewelry item, as you run the risk of losing the piece or the stone. Avoid exposing white gold to chlorine, as chlorine can damage white gold jewelry. Avoid using alcohol on pearls, turquoise, emeralds, opals and other soft or porous gems. This means you must avoid exposing these stones to hand sanitizer gels and sprays as well, which are largely made up of alcohol. Never clean jewelry over the sink! You risk dropping entire jewelry items down the drain; a loose stone may be dislodged from its setting and lost during the cleaning process. Richard Millano; Jeweler (Ret. ); Richmond, VA.